Alan Gaffney says he has no issue with getting tough as he targets a top-four finish with Saints this season. But the new coaching consultant knows he must first rebuild belief levels at Franklin's Gardens. The Saints squad is severely lacking in confidence following a run of 12 defeats from the past 13 games in all competitions. They were trounced 50-21 by Harlequins, who had lost five of their previous six games, at Twickenham last Saturday. Gaffney started work at Northampton on Monday morning, having watched the Wanderers beat Worcester Cavaliers on Sunday. And when asked whether he aims to adopt a carrot or stick approach, the Australian said: "I will be tough enough when I have to be. 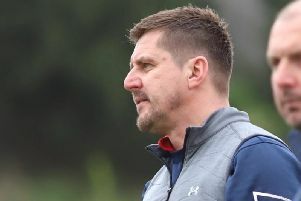 "I'm a skills-orientated coach and I've seen a lot of opportunities Northampton have created in the past three or four weeks without being accurate enough. "It's extremely important we work hard on our skills to be able to play the level of rugby we want to be able to play. "I'll be tough when I have to be, but at the same time I want to be encouraging of the players. "I don't expect them to go into a corner. "Obviously people are down and there's a lack of confidence, which is the primary problem. "The squad is a pretty talented squad and should be achieving better results than they have been. "Looking at the first four wins, when they played with momentum, playing on the front foot and with enthusiasm, you can't say that's been the case during the past few games I've seen. "There is a desire to play but they're not backing themselves to do it. "I did address the players on Monday and I told them I don't think it's an ability issue and that we've got to go out and give this a crack and really have a go. "Once that confidence comes back, and I don't think it will take long, there's got to be a couple of tweaks and things will turn quickly." Saitns currently sit 10th in the Aviva Premiership, having lost seven successive league matches. They are 13 points ahead of bottom side London Irish and 15 behind fourth-placed Gloucester, who they host on Saturday. And Gaffney said: "I'm working on the basis that we're aiming top four. "We're not even contemplating anything else. "It may be a big ask but if you win a couple of close games and all of a sudden you're challenging for top four. "It's up to us to challenge for those positions. "I'm not even thinking about that bottom position. "I understand promotion and relegation and I totally support it because it's a good system, but it's not on the agenda as far as we're concerned." So how does Gaffney plan to change things at Saints? "I'm not going to reinvent the wheel," he said. "They're halfway through the season and it can't be expected that I can come in here and change things overnight. I wouldn't expect to do that. "It will be minor adjustments in little things they're doing. "It's more about emphasising the fact Alan Dickens wants to play, Dorian wants to play and there's only three things you can do with a rugby ball: kick it, pass it and run it. "We need to put players under pressure to make the tough decisions and not take the soft option. "We need to be a lot smarter in the way we play and we will get the results. "It's good to come in with fresh eyes and I see positives, I don't see negatives." Gaffney is now 71 years of age, but he says he is feeling fresher than ever. "I feel well in myself and I feel the best I've felt for a long time," he said. "I've been doing coaching back home, doing a lot with Rugby Australia and with the provinces. "I've been working with the Under-20s and trying to develop the youngsters. "To get back involved full-time in that role with a senior team is a great challenge and something I'm really looking forward to."